As a direct response copywriter, my biggest day-to-day challenge is writing copy that generates cash for my clients. My copy – or at least one version of the copy – has to perform. I’m a sales person and when sales people fail, they get fired … and that’s totally understandable. But here’s another challenge: speaking with a potential client who has endured a bad experience with another direct response copywriter. Typically, the potential client has hired a copywriter, paid a sometimes significant fee, and watched the copy fail miserably. There may have been other issues like missed deadlines, a haughty attitude, or something else. But the biggest problem is usually the poor return on the investment made in the copy. And there’s the real problem. The potential client isn’t letting the copywriter fail. The first attempt at the copy fails – as it often does – and the client thinks the copywriter is a dunce – an expensive one at that. The clients I have worked with who have enjoyed the most success are the ones who EXPECT me to fail. That’s because they test like crazy … constantly. After a lot of copy that fails to beat the control, one attempt will hammer the control and everyone will be happy. I’m upfront with potential clients about copy. I say what I just wrote: you have to test. If the potential client isn’t with that plan, then the whole situation is probably going to end in tears. If you've had a bad experience with a copywriter, that's understandable. But ask yourself this question: "am I testing enough?" I'm a direct response copywriter. I write direct response copy for clients around the world. 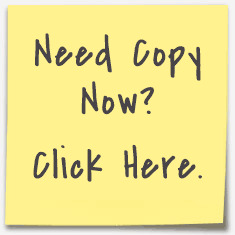 Enter your information to the right for my free series: Seven Steps to High Converting Copy. Or contact me here if you have a project you'd like to discuss. I'm also a Dan Kennedy certified copywriter for information products.